Today, we’re going to walk you through our step-by-step guide to making a gaming PC. 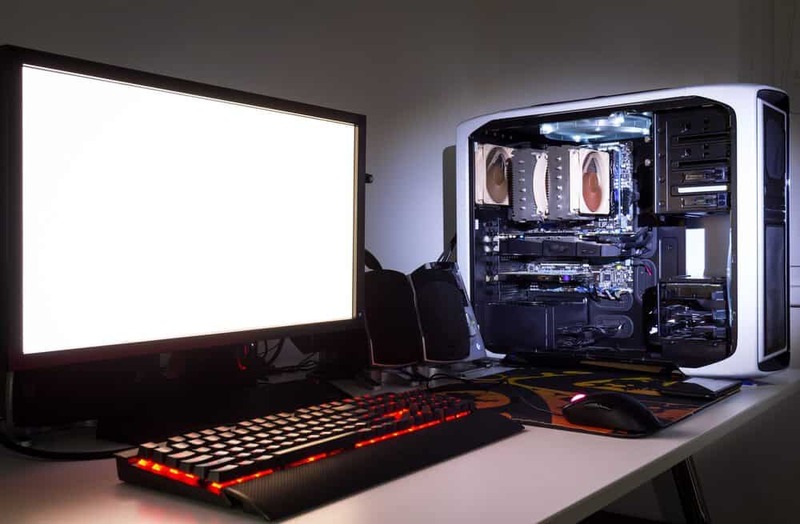 Before building or buying a PC, you need to make sure that you have a solid understanding of your needs in relation to what you can actually afford. When buying new, we recommend starting with a budget of at least $300 for the core components of your build. This would be very entry-level, however, and wouldn’t be suited for more cutting-edge modern games like Monster Hunter: World or Doom Eternal. For playable framerates in cutting-edge modern games, you’ll want to bump up into the $400-$600 range. From $700-$800, you’ll be more than well-equipped for modern titles and you’ll even be able to get into some VR gaming and content creation on the side. Once you start breaching $1000, all the way up to $2000 and higher, you’ll find that your returns in actual performance begin to diminish. You’ll only find this extra performance useful if you must have the best of the best, or if you plan on streaming/rendering video daily. You’re here, so chances are you’re definitely going to be using this PC to play games. That being said...what kind of games will you be playing? eSports titles are made to run decently on low-end systems and very fast on mid-range to high-end systems. If you’re only interested in these games, you shouldn’t need to spend any more than $400. This also applies to console emulation and older games. As we alluded to earlier, cutting-edge modern titles will work best at $600 and higher. You want immersive gameplay at high framerates, beautiful graphics settings, and you want it to stay that way for at least the next three or four years. If you fancy yourself a professional gamer, or you want to become one, this is when you start treating your PC as an investment. This is when you pay $1000 or more for your PC build, with a CPU beefy enough for the streaming and rendering you’ll be doing on a daily basis. When choosing parts for your PC, there’s a lot more to take into consideration than just price and popularity. You need to make sure that your parts are all compatible with one another (tools like PCPartPIcker are great for this if you don’t want to use our builds), and that they’re reasonably-balanced. The worst thing you can do is spend $200 on your GPU, only to find that your $50 CPU is bottlenecking it to the point where you can’t play your favorite games. Now, let’s walk you through each one. The processor, or Central Processing Unit, is essentially the “brain” of your computer. It is the second most-impactful component on gaming performance, just behind the GPU, and is the most important component for content creation. In some games, the CPU may actually be more important for getting high FPS! The three most important things to know about a processor are its clock speed, cores, and threads. Clock speed is a measure of processing speed, in gigahertz (GHz). Cores are usually assigned to different tasks in your system, but certain applications can utilize multiple cores at once. Threads used to correspond to cores, but many high-end processors enable a technology called “hyperthreading”, which adds an additional thread per core, essentially creating an additional virtual core. Core count and clock speed really only serve as direct measures of performance with processors in the same generation, however. A quad-core 3 GHz CPU from 2012 is going to perform much, much differently from a quad-core 3GHz CPU released in 2019 thanks to underlying architectural changes. For this reason, and for future-proofing, you’ll always want to buy up-to-date CPUs and compare them to their siblings when making a buying decision. If you want to compare disparate CPUs, we recommend using a tool like UserBenchmark to see how they compare to each other in terms of raw computing performance. Intel processors are known for their stronger single-core performance, making them particularly suited for gaming. They are criticized frequently for inflated pricing and more restrictions on overclocking, though. AMD processors are known for their stronger multi-core performance, making them ideal for multitasking and productivity tasks. In recent years, their single-core performance has improved significantly, nearly catching up to Intel. These tend to veer much cheaper. If you want to better understand the current CPU market, then check out our CPU hierarchy article. We’ve also gathered the best Intel and AMD CPUs into one place, as well. You’ve picked out your CPU. Now, you need a compatible motherboard. With Intel CPUs, you’ll need both a K-series CPU and a Z-series motherboard. With AMD CPUs, you’ll need B- or X-series motherboards. All modern AMD processors are overclockable. Things like USB ports don’t tend to change between sizes, but the smaller you go (ATX being biggest, ITX being smallest), the less RAM and PCIe slots you have. For budget builds, we recommend the happy medium of MATX- ATX and ITX tend to be more expensive, especially when you add in the cost of a compatible case. Once you get past the core questions of overclocking and compatibility, what really matters is buying from a reputable manufacturer. Gigabyte, ASUS, MSI, EVGA, and ASRock are our recommended choices. Buying from a no-name manufacturer is a house fire waiting to happen. Do note that motherboards have the least, if any, effect on gaming performance. You don’t need to buy a gaming motherboard for a great gaming rig. That being said, we still have our favorite motherboards. The GPU, or Graphics Processing Unit, will be the component that impacts your gaming performance the greatest, at least in most titles. To explain how the GPU works, envision your favorite multiplayer shooter. The CPU is keeping track of what the players are doing, where they are on the map, what they’re shooting at, even if you can’t see it happening. The GPU takes this information and renders the actual graphics that you’re seeing, at the resolution and settings you’ve told it to. While the GPU is the most important component in a gaming computer build, it still needs the CPU to function. If the CPU isn’t processing what’s happening in the game fast enough, your GPU’s visual output will be bottlenecked, since it will have to wait for the CPU to catch up. As a general rule of thumb, try not to spend any less than half of your GPU budget on your CPU-- this will help you avoid throttling in all but the most CPU-intensive games. When it comes to GPUs themselves, looking at a spec sheet usually won’t be all that helpful. Clock speed is even less indicative of overall performance here-- we only recommend using it as a performance metric between the same card from different manufacturers. VRAM (Video RAM) is actually a much more helpful measurement. But not all types are created equally. GDDR5 is the standard- don’t accept anything lower than this. GDDR5X, GDDR6, and HBM (High Bandwidth Memory) are all an improvement, but in general the rules above should still apply. At 2GB of VRAM, expect decent performance in 1080p titles with standard-definition textures. At 4GB of VRAM, expect decent performance in 1440p titles, or 1080p titles with high-definition textures. At 6GB and higher, expect good performance in VR titles, 4K titles, and 1440p titles with high-definition textures. If you want to understand exactly how a card performs, though, it’s always best to look at benchmarks. If you were buying a GTX 1060, for instance, you’d want to Google “GTX 1060 Benchmarks”. There are quite a few GPUs on the market, but our GPU hierarchy article goes over all of them so that you understand the current landscape. Also be sure to check out our favorite GPUs. Aside from the single-or-dual channel dilemma, RAM speed usually won’t make a very big difference in gaming or common multitasking. Where RAM speed shines is in productivity applications. Be careful though, because finding your RAM’s speed is more complex than just knowing its clock speed. You should only be buying DDR4 RAM, by the way. DDR3 RAM is slower and will only appear in your system if you haven’t been listening to us. Stick to the modern CPU standards. What matters most with RAM is the quantity. The more RAM you have, the better the rest of your system will be at managing multiple applications and meeting the memory needs of demanding modern games. Below, we’ll give a list of common RAM capacities and which is best for gaming. 4GB - The absolute bare minimum. Suitable for light gaming and basic computing tasks. Will be easily overwhelmed by modern games, however. 8GB - The happy medium, for now. Great for gaming and multitasking, though a few cutting-edge titles have begun to consume even this amount of RAM. This is best for today, and for at least the next few years. 16GB - The best. It will be at least 4 years, if not many more, before games start requiring this amount of RAM in your system. This is also the amount you want to start at for productivity work. 32GB - Serious productivity or just showing off. When you are buying RAM, you can reference our best RAM guide to give you a starting point. This is actually fairly simple. An SSD, or Solid State Drive, is a storage drive with no moving parts. This makes it much, much faster than an HDD (hard disk drive), but also much more expensive per GB of storage. If you want quality, get an SSD. SSDs are more durable and smaller overall. If you want quantity, get an HDD. These are larger, but less durable. If you can afford it, we recommend getting both. An SSD that’s a couple hundred gigabytes can hold your operating system, your programs, and a few of your favorite games, resulting in a much more responsive-feeling system overall. Everything-- games included-- will load faster. You can even use your SSD as a cache (sort of like RAM… kinda). An HDD, meanwhile, can be used for storing media and the rest of your games, especially non-multiplayer ones where loading times don’t really matter that much. This will result in slower loading times for games, but won’t really change anything about watching video or listening to music. Since HDDs and SSDs are so different, we actually created separate buyer’s guides: one highlighting the best hard drives and the other outlining the best SSDs. The Power Supply Unit, or PSU, is fairly straightforward...as long as you follow a few key rules. Buy from a reputable manufacturer. No-name manufacturers will often sell bad PSUs for really low prices, which is enticing… until your system gets fried or catches fire. Stick with reputable brands like Corsair, EVGA, and SeaSonic for these. Make sure you have enough wattage for your system. Using PCPartPicker or Wattage Calculator, you can determine how big your PSU needs to be. The PSU requirements listed on GPUs will usually be inflated, but you may want to opt for these if you plan on overclocking. 80+ ratings refer to efficiency. The higher the efficiency, the less excess power the PSU will consume and the less heat it will exhaust. Don’t buy PSUs without at least basic 80+ certification-- anything less is a massive red flag. If some of these rules kind of scare you, then you can reference our PSU buyer’s guide to make sure you’re buying a reliable PSU. Once you’ve gotten compatibility and cooling out of the way… the rest just comes down to build quality and personal preference. Your best way to gauge the former is to check out reviews-- the latter is up to you. We’ve actually created two different guides for cases. One covers the best mid-tower cases, which are what we’ve recommended above, and the other covers the best full tower cases, which are larger and meant for more extreme builds. You’ve figured out your main build-- now, for the rest. Your operating system is necessary. If you have the money for it, just get Windows 10-- it may not be perfect, but earlier Windows OSes are rapidly losing support, and you can customize 10 to be more like 7 or XP if you want. If you can’t afford Windows 10 right now, opt for a Linux distribution (Ubuntu or Mint will be best for common users) or just download and install 10 anyways. You’ll lose some features, but none that will actually impact gaming performance in any meaningful way. If you don’t already have a mouse and keyboard, you’ll want to get them. If you play shooters, your mouse will make a much bigger difference on your gaming performance than your keyboard. If you play MOBAs, MMOs, or strategy games, the opposite rule applies. Click here for our top gaming mouse picks. Click here for our top gaming keyboard picks. Your monitor should scale to the rest of your build. You shouldn’t be buying a 1080p monitor alongside a $2000 build, for instance. That’s just wildly inefficient. Go with 1080p60 for any build up to $500. Go with 1080p144 or 1440p60 for any build up to $800. Go with 1440p144 or 4K60 for any build up to and past $1000. Click here for our top gaming monitor picks. If you’re really dedicated to keeping your system cool (especially important for overclockers), then you should be ready to buy some extra case fans. Below two highly recommended high-performance options, but we’ve rounded up some more of the best case fans and the best CPU coolers. Performance - The Noctua NF-F12 fans provide excellent performance and run fairly quiet. RGB - The Corsair HD120 RGB fans offer excellent performance and RGB lighting, but aren’t quite as quiet. Let's Build Your First Computer! Congratulations- now you know just about everything you need to! If you want to try your hand at putting together PC builds of your own or imagining how they’ll come together, use PCPartPicker or check out PC Building Simulator. If you don’t want to pick out your own parts, that’s okay. Start with one of our builds, linked below. $300 Build - Our basic tier, suitable for eSports and modern games at lower resolutions. $400 Build - Our value gaming tier, a console killer. Suitable for modern gaming at 900p and 1080p. $500 Build - Our best value tier, suitable for modern gaming at 1080p and high settings. $600 Build - Our entry into the midrange, where 1440p and VR become possible at low settings. $700 Build - Where 1440p and VR get better, and content creation becomes viable. $800 Build - Where 1440p and VR kick into high gear. $1000 Build - Where 4K and serious content creation becomes possible. $1500 Build - Where 4K improves and serious content creation gets good. $2000 Build - Where everything is within your grasp. Welcome to the top of the mountain.